Registration can be accomplished at the Santa Fe Century website after January 1, 2019. Cyclists can choose to pedal either 25, 50, or 100 miles and 20 mile dirt ride on the Santa Fe Trail. Bike helmet and ride numbers must be worn to receive Sag-Wagon support and services at Food-Stops along the route. Riders must pledge a minimum of $100.00 to Ride for the Band. Riders may also register in person at the Santa Fe Century venue on afternoon of Saturday, May 18 and Sunday morning, May 19. 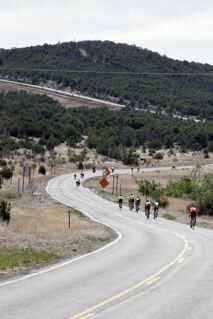 For detailed ride information about routes, schedule, and other particulars go to SantaFeCentury.com. Once you have completed your registration on the Santa Fe Century website, go to www.RideForTheBand.com to complete your support for the SFCB. Note - It is a two-step process: first you register with the Santa Fe Century and sign your waiver; second you make a donation to the Santa Fe Concert Band at www.RideForTheBand.com.